Our remodelled 1930s bach is light and airy with a modern coastal feel and a touch of mid-century styling. Its position, on an unusually large section with a giant oak tree & close to many of the region's beaches make it perfect for families. Both the living area and the sunroom open onto the deck which, with outdoor table & chairs & a Weber gas BBQ, is an ideal spot for al fresco dining. An indoor fire, plenty of firewood, a Smart internet TV and unlimited WiFi means our place is a great destination no matter what the season. We have just installed a 8kw heat-pump/air conditioner in the lounge too. We have children ourselves so the bach is well equipped for keeping your little ones occupied. They can chase butterflies, play on the tyre swing or get active on the trampoline. Other equipment includes a Boogie board, fishing rods, books etc. If you like cooking at home our place comes with a full oven, baking dishes & herb garden, as well as a waffle iron and Nespresso coffee machine for lazy breakfasts. The master bedroom features a comfortable Queen-sized bed, wardrobe & large chest of drawers as well as a bedside table & lamp. It is located off the lounge & also has access to the sunroom. 2nd bedroom features a King Single and a Single bed that can be pushed together to form a Queen upon request. A small foldaway single bed can be made up in the sun-room for a 5th guest. The sun-room also has an armchair & large desk - in case you have work to complete while on vacation. Well equipped kitchen - coffee machine; blender; K-Mix Kenwood mixer; baking trays; waffle iron and recipe books for inspiration. Guests have the entire house to themselves with car parking for two vehicles, separate laundry & an undercover clothes line. Coopers Beach has a large supermarket, butcher, coffee/gelato cart, medical centre, takeaways, fishing/tackle shop and natural therapy practitioners. The historic Mangonui township - home to the world famous Mangonui Fish Shop - is only 5 minute drive away. The coastal highway bi-sects the beach settlements along this part of Doubtless Bay. As a result road noise can be heard from most properties on the ocean side of Cable Bay and Coopers Beach, including our bach. Our house is child friendly but the section is not fenced. Special conditions: Please take extra care on the Airest sofa by not eating, drinking or sleeping on it. It is an irreplaceable collector's item from the 1950s. Extras: Cleaning is NZ$120.00 per stay with all linen included. Guests to supply beach towels. Like many New Zealanders I caught the travel bug with my first OE (Overseas Experience) to Europe in my early 20s. I have lived in Aspen, Colorado and London but was drawn back to my home country by its natural beauty and laid back lifestyle. I have worked as an art curator for the past two decades and have two beautiful children. In recent times holidays have been family vacations closer to home with Samoa, Bali and Noosa among our favourite destinations. Although I like to head off the beaten track and away from the crowds I also love short stays in cosmopolitan cities where I can get a fix of contemporary art, cuisine from around the globe & strong coffee. Aside from travelling and art my other passions include rennovating, design, history and anything vintage. Private walkway to Chucks Cove from the bottom of our section; Large grounds with a giant oak tree that features a tyre swing make it great spot for kids to play. The native Harekeke (flax) & a Pohutakawa tree that blossoms with beautiful red flowers in December attract ample birdlife. Spot Orca or Dolphins in Doubtless Bay from the deck. A grassy path leads from the bottom of our section to Chucks Cove, a secluded bay that only locals know about. Air conditioning unit in the living area which flows to the master bedroom. The second bedroom has a quality oscillating Dimplex fan. We have installed a 8kw heat pump for winter warmth . There is also a wood-burner/fireplace and a five-fin oil heater. Wood for the woodturner fire is supplied to ensure you are cosy on the coldest winter night! Good cellphone & internet coverage. Wireless broadband. Bathroom towels, bathmat, hand towels & tea towels. Two large, luxurious beach towels. Classic mid-century Airest settee, armchair & beanbag. Heating/Cooling by heat pump/Air conditioning. Wood fire for extra Winter cosiness. French doors leading to decked area. Well equipped full kitchen with cooking implements, crockery, baking dishes & refrigerator/freezer. Dining area is in the kitchen. The table has a cushioned window seat and 2 timber stools. There is also an outdoor dining table & four outdoor chairs. Smart TV supports Freeview channels, surfing the internet, downloading movies or bring your own NZ Netflix account. Bluetooth speaker to stream your choice of music. Duplo, trampoline; tyre swing; butterfly nets; fishing rods. Gently sloping lawn with iconic Pohutakawa tree (blossoms in Jan); Majestic Oak tree with a rubber tyre swing; Swan plants attract Monarch butterflies & pick fresh herbs grown in the garden. Good sized deck with sea views, BBQ, outdoor table & four dining chairs. 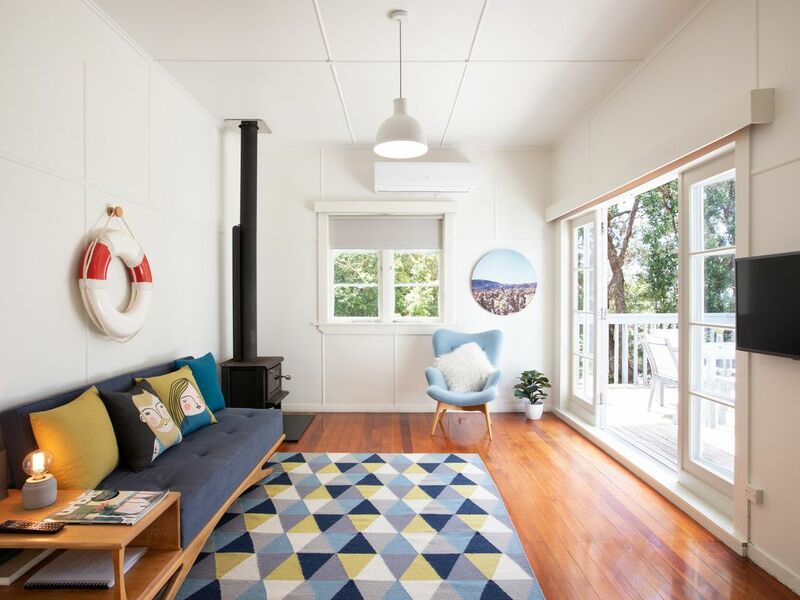 Our classic kiwi bach is a newly renovated wooden bungalow that has shared access to Chuck's Cove, a sheltered bay that only the locals know about. This lovely kiwi bach is child friendly and situated between two great beaches. Lovely cottage, so pretty. Everything you need. Gorgeous area. The Property is beautifully manitained and in a great location. The Property is beautifully manitained and in a great location. The linen and beds were of a high quality and comfortable. Downsides would be traffic noise being on a main road and no curtains in the lounge. The sofa is quite hard too and not terribly comforable (although it looks very stylish) so that combined with no curtains didn't make for cosy evenings. The addition of some throw rugs and perhaps another super-cosy chair or two would help enormously. Thanks for your feedback. The bach was furnished exactly as presented on this website. There is fireplace in the lounge and a pile of firewood for winter guests which makes the bach very cosy. On your advice we have added another armchair and a rug for future guests, most of whom visit over the warmer summer months. The French doors out to the deck are the only windows without dressings and we only recently removed them to improve the views and natural light inside. These could be rehung. Awesome location with sea view from deck. Great little funky Bach. Lovely bay views and everything we needed for our stay. Cable Bay is a 10-minute walk away & Coopers Beach is a 15-minute walk in the opposite direction. We are located within a 5-minute drive to the historic Mangonui township which is home to several laid back cafes, a Thai restaurant & several Fish & Chips shops. Other beautiful beaches in the area include Matai Bay and Rangiputa on the Karikari Peninsula less than 30 mins away. Besides the main attraction - the local beaches - there are many hiking trails, wineries & world class golf courses (Carrington, Kauri Cliffs) are all within easy reach. We are 38 mins by car away from Ninety Mile Beach & 90 mins from Cape Reinga, the most northern tip of New Zealand with special significance to Maori. Waitangi Treaty Grounds, Rangihoua Heritage Park and the historic Kerikeri Stone Store are 40-60 mins away by car.